Source: John Carney, “Stolen iPhone goes roaming … all the way to Mongolia,” South China Morning Post, 14 Oct. 2012. Funny story and nice comic! Wonder how much the Mongol paid for the phone. Yes, it would be very interesting to know how much was paid for the phone for each (of what must have been) several transactions! Cantonese may be a different dialect but it shares most of the written words as in Mandarin and so your “second hand phone” written words are just as valid either way. Thanks (as always!) for the language tips. I wasn’t sure if any of those characters are different in traditional form or if there was a more “local” way of saying “second hand phone” in Hong Kong. 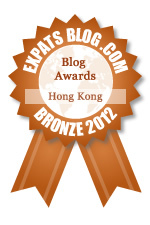 As for the Hong Kong Blog Review write-up: I was very, very pleased to receive it! Thanks for the congratulations! And kudos to you for noticing so quickly. Hong Kong and Mongolia – two very different cultures for sure! I wonder if she kept any of the photos as a momento. Maybe she still receiving new photos?